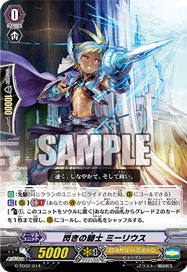 [A] [(V)/(R)]: [Counterblast: (1)] When this hits a Vanguard with an attack, if this is Boosted by a ::Gold Paladin:: and you have 4 or fewer Rearguards, you may pay cost. If so, reveal the top card of your Library. If it's a ::Gold Paladin::, call it to a vacant (R), otherwise shuffle that Library. Military band stands on the frontline and increases the morale of the knights.